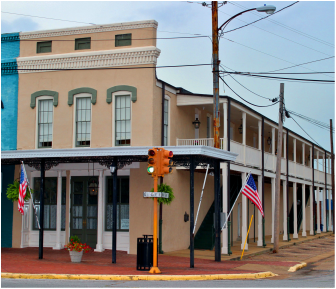 Our three luxury suites are available on the second floor of our recently renovated building located on the Courthouse Square in the National Historic District of Holly Springs, Mississippi. Each suite has its own private sitting room, kitchen and laundry. A self-serve continental style breakfast is provided consisting of juice, coffee, milk, cereal, fresh fruit and pastries. Please let us know in advance if you have any special dietary requirements or food allergies. We do not allow smoking in the rooms, but there is a balcony that runs the length of the second floor where we have provided tables and chairs for you to relax and enjoy. Please, no children under the age of 12. Also, no pets allowed. There is a two night minimum stay during special events such as the Holly Springs Pilgrimage, Strawberry Plains Audubon Center Hummingbird Festival, Kudzu Festival, Kenny Brown's North Mississippi Hill Country Blues Picnic and Ole Miss Football Weekends. Check-in is any time after 3:00PM and check-out is 11:00AM. We require a 50% deposit at the time of reservation and there is a 14 day cancellation policy.